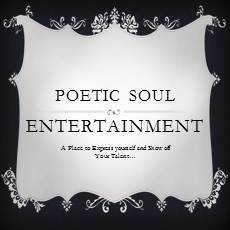 Poetic Soul Entertainment is one of our newest affiliates in our ever-growing food community. They are mostly about art, such as poem, stories, songs, and so forth. We will be working along side each other to help continue to grow both our communities as well as our relationship with our affiliation. So show them your support as well. Especially if your into the arts. Poetic Soul Entertainment is a great place to go share your work with the world. We utilize tools such as Facebook, Blogs, Forums, and much more to really get your work out their and seen by not only our community but for who is our there who wants to look at it as well. Here is some quick, basic information for anyone who needs it. Feel free to come and check us out. You can also become a member of our website which is totally free. Once again its a really great place to show off your talents in the arts. If you want your stuff noticed then this is the place to do it. We are a bit of a small website right now, but that is a result of starting just a few days ago and we are always updating to make it better. Thanks. - Poetic Soul Entertainment.